The four-time AMA ProStar Hot Rod Cruiser Class Drag Racing Champion returns, with even more style. Twin-bore fuel injection provides spot-on fuel delivery under all conditions. Rigid, light and strong aluminum frame, inverted 41mm fork and an adjustable link-type rear end provide near-sportbike handling. 200/50-ZR17 rear radial tire looks right and puts all that torque efficiently to pavement. Special Midnight Warrior rolls out in special black paint, black air cleaner, engine covers, exhaust. The industry standard for V-twin excellence features 102-cubic-inch (1670cc) displacement, pumping out asphalt-ripping torque and acceleration. Air-cooled, long-stroke, OHV, 48 degree cylinders with pushrod valve actuation keeps engine height down; large cooling fins, ceramic composite bore plating and a one-piece head cover provide more efficient heat dissipation. Forged pistons accommodate higher-RPM performance thanks to reduced reciprocating mass. Rare earth flywheel magnet for faster-revving power delivery and increased high-RPM durability. State-of-the-art electronic control unit (ECU) ensures precisely metered fuel delivery and optimal ignition spark control using 3-D digital CD ignition mapping for each cylinder. 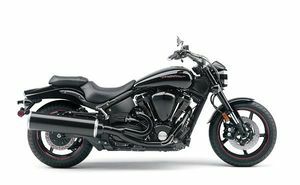 High-performance 2-into-1 exhaust system features stainless steel headers and a massive muffler that boosts horsepower while putting out a throaty V-twin growl. Dry sump lubrication system uses a handy spin-on filter. Specially designed, class-exclusive, aluminum double-cradle frame and swingarm increases rigidity by 41% (over standard Road Star frame), for tremendous strength and durability. Super-rigid 41mm Kayaba inverted telescopic fork in beefy, cast-aluminum triple clamps gives 5.3 inches of travel for exceptional sport-oriented performance. Link-type, preload and rebound adjustable single rear shock delivers outstanding rear-wheel tracking for precise handling and plush ride quality. Dual 298mm front disc brakes and radial-mount four-piston calipers, and a 282mm rear disc combine for incredible, supersport-spec stopping power. Lightweight, cast-aluminum five-spoke wheels wear low-profile, competition-spec 120/70-ZR18 front and a massive 200/50-ZR17 rear radial for awesome traction and cornering grip. LED taillight provides excellent visibility and very sano look. This page was last edited on 28 November 2010, at 02:56.